The last talk of WFLP on Thursday, 16:58h has been cancelled. The online program already includes this update. On tuesday, the registration desk will close at 14:45h. The program of the conferences can be found here. The events are hosted and financially supported by the Goethe-University Frankfurt am Main. Early registration ended on Wednesday, 15 August 2018. The social event and the conference dinner (both are on Tuesday, September 4th) is included in the above fees (except for "WFLP only"). Additional tickets (for guests) for the social event and conference dinner may be purchased on site, but please mention this during the registration so that we can reserve them for you. Frankfurt is located in the center of Germany and Europe. Due to its international airport and railway stations for long-distance and regional trains, it is easy to reach Frankfurt from all parts of the world. 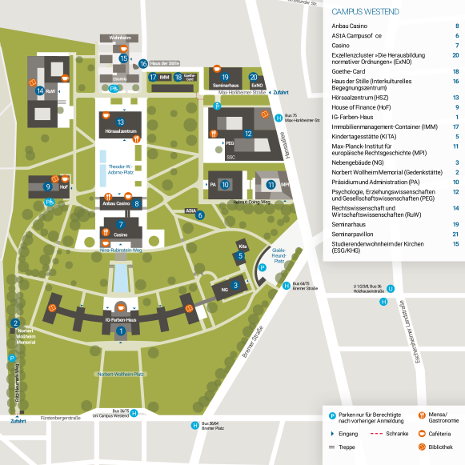 The events will take place at Campus Westend of Goethe-University Frankfurt am Main which is located quite central in the city of Frankfurt am Main. Frankfurt has a lot of hotels and hostels, and we do not provide a recommended conference hotel. However, in the Google Map we provide several recommendations for hotels and hostels. Note that you can also use the official tourist website of Frankfurt to find and book hotel rooms. Frankfurt International Airport (FRA) is served by all major airlines. It is close to the city centre and is connected directly to the Frankfurt public transport network. The local S-Bahn trains take about 11 minutes to reach the city centre from the airport station. Follow the airport signs to the regional station Regionalbahnhof (S), Terminal 1, B Concourse, Level 0. Trains to the main station and Frankfurt City go every 15 minutes, usually from platform 1; you need to buy a ticket from a vending machine before boarding the train (see notes on the local public transport). Take the regional trains (S-Bahn) S8 or S9 from there towards Frankfurt and stay on the train until you have reached Hauptwache. Then change to the underground route U1, U2, U3, or U8 (all directions but the Südbahnhof direction) and and get off the train at Holzhausenstraße/Uni Campus Westend. From there it is a 5-minute walk to the campus. Frankfurt's main train station (Frankfurt am Main Hauptbahnhof) is connected to the high-speed railway network and serves lots of destinations in Germany and Europe. Germany's most important railway company is Deutsche Bahn. You need to buy a ticket from a vending machine before boarding the train (see notes on the local public transport). Take the regional trains (S-Bahn) S1/2/3/4/5/6/8/9 from the main station (Hauptbahnhof) to Hauptwache (two stops) departing from platforms 101 and 102 (underground level). At Hauptwache change to the underground route U1, U2, U3, or U8 (all directions but the Südbahnhof direction) and get off the train at Holzhausenstraße/Uni Campus Westend. From there it is a 5-10-minute walk to the conference location. Local public transport is operated by the Rhein-Main Verkehrsverbund (RMV). Tickets have to be bought from ticket machines immediately before boarding the trains, trams, or busses. The machines accept coins and bank notes (€5, €10). The tickets are valid throughout the town on buses, trams, underground, and regional trains. For more information, see the route map and the RMV Website. There are several companies from which you can hire a shared bike in Frankfurt. Among them are Byke, Deutsche Bahn - Call a Bike, LimeBike, and Nextbike Some more bike-rental companies can be found on the web pages of Frankfurt Tourism. 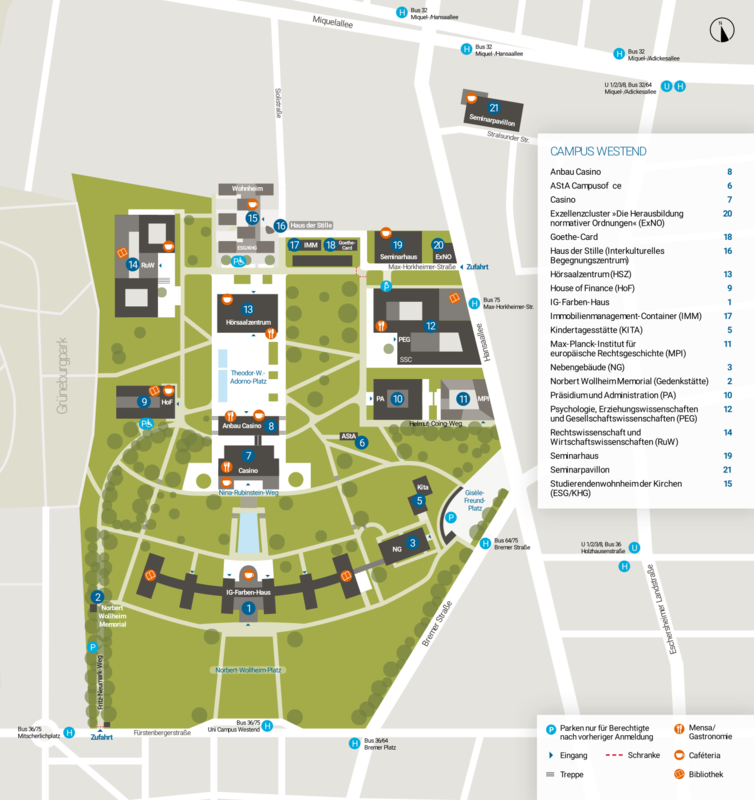 The address of the conference location on Campus Westend is Theodor-W.-Adorno-Platz 1 (in some older navigation systems the right adress is Grüneburgplatz 1.) Please note that there is only a very limited number of non-residential parking spots in the adjacent streets. The closest parking ramp is at the "Palmengarten"